Hi, I've finally managed to make a card this weekend! We went shopping to our largest nearby town (1 1/2 hours drive away) yesterday so there wasn't much free time by the time we got home. Sadly my last chicken was killed by a snake last week, so I thought we'd revamp our worm farm to put our veggie scraps into. While tidying up the garden to reposition the worm container I cut my pinky with the seceteurs, boy are they sharp!! It doesn't need stitches but it'll probably take a while to heal up. I don't think I'll be able to wash the dishes for a while lol! I made this card to enter a few challenges. At Inkspirational there's a photo for inspiration. I used lots of snippets., so I can enter the playground at Pixie's Crafty Workshop. 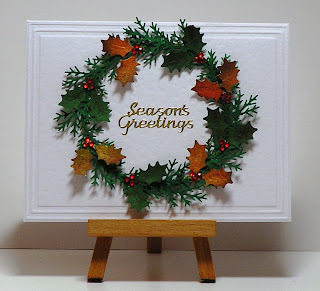 The circle frame for the wreath was a leftover from resizing a circle using a Spellbinder die. The autumn holly leaves are punched from the leftover sheet of watercolor paper I coloured with distress inks to create a couple of autumn themed cards. The green leaves and holly are cut from snippets of green card. It's amazing how you can manipulate a punch to get just one more cut out of a scrap!! At Simon Says Stamp Monday Blog and Simon Says Stamp Wednesday Blog the themes are anything goes, and at Addicted to Stamps & More the challenge is to create a Clean & Simple card. Materials used: Martha Stewart Branch and Holly punches; distress inks; Stately embossing folder; bling and sentiment sticker from stash. This is stunning! Those leaves look so real! :) Thanks for playing along over at the Simon Says Stamp Wednesday Challenge Blog! Really fabulous Cathy! so elegant and the wreath is beautiful. Shame about the chook :( Snakes are my phobia so am still shuddering here. Hope the pinkie heals soon! Love this wreath... so real looking. Wow, no dishes but at not such a nice cost. Hope that lil' finger heals soon. Hi Cathy. Fabulous design. Love your wreath with the holly and autumn-colored leaves. Great job on covering off so many challenges with this gorgeous card! What a beautiful wreath, Cathy, and it's framed so beautifully with this EF! Your cards always send me on a shopping spree! How beautiful! I love your stylish wreath on that clean and simple, elegant background. Thanks for joining us at Inkspirational! What a beautiful card - so simple in concept but perfectly executed for a wonderful result. Thanks for joining us for this week's Simon Says Stamp Monday Challenge! Gosh Cathy this card is bootiful! Love that wreath. My condolences over your lost chook. So sad. I am always very upset when I lose one - they are so funny. I would keep the not being able to wash up for as long as possible! I burnt my thumb on the glue gun the other night so can sympathise with you. Cathy, this is perfect in every way!!! WOW! Stunning wreath‼ Sorry to hear about your chicken - ugh I hate snakes. You've had a time of it! Such an outstanding, elegant card! Thank you for joining us at Inkspirational!